If you enjoy a delicious, creamy latte to start your day, wouldn’t you like to be able to create your brew at home, without having to endure the hassle of waiting in line at the coffee shop? Of course, there are ways of making your own barista-style latte at home, as we’ve covered in an earlier article. But sometimes we all just want to be spoiled a little and have someone (or something) else do the work for us. Now, before you throw up your hands in horror at the cost of buying your own latte machine, ask yourself how much you spend on those expensive coffee house lattes each month, (remember to factor in time spent standing in line). Now multiply that out over a year. Your final figure will probably be close to the price of an efficient, convenient, hassle-free home brewing latte machine. Go figure. Espresso machine or latte machine? But don’t you just need an espresso machine to make a latte? After all, a latte is simply a shot of espresso mixed with frothed milk. So, why not buy a basic home espresso machine that has a built-in milk frother. Alternatively, just buy a milk frother – the handheld version that costs a few dollars will do fine, won’t it? Well, yes and no. There are two primary differences between an espresso machine and a latte machine: price and convenience. When it comes to price, you’re looking at super-automatic machines. Okay, so they’re expensive, but all you have to do to brew the perfect latte is press a button. At the other end of the spectrum you have machines that brew coffee over milk. An immersion mixer then froths the milk. Now, in reality that’s a café au lait not a latte, but it still tastes pretty good. If you have a generous budget, you’re a die-hard latte lover, and you don’t mind relinquishing control over the brewing process, you must have a super-auto latte making machine. These machines do everything for you, from tamping the coffee to micro-foaming and milk steaming. You can even adjust the settings to make minor tweaks to your brew. So, you know that every time you press that button, you’ll get exactly the same brew. You don’t get that in a coffee house, because every barista uses a slightly different technique. For consistency of flavor and texture, choose a super-auto latte machine over the hand-made version every time. Another important consideration is the micro-foam that these machines produce. You simply can’t replicate the smooth, velvety texture of the froth that super-autos make using a regular milk frother. If you’re budget is modest, you already have decent barista skills, or you like a mix of control and convenience, a semi-automatic espresso machine will give you exactly what you want. One thing to take into account is the number of drinks the machine can make you back-to-back. If you want to make several lattes at a time, look for a machine that has two boilers; one for the espresso and one for steaming the milk. A single boiler machine is fine if you only want to make a latte for yourself, but it will be too slow if you need to make multiple drinks. For the dedicated home baristas who appreciate the art of brewing, we recommend semi-automatic machines. We’ve included some of the cheaper entry-level latte machines, as well as some more expensive models that are aimed at established, more experienced home baristas. Make sure to take your experience level and budget into account as you go through the list. The Mr. Coffee Café Latte makes delicious lattes in one simple touch – the system is pretty much fool-proof. 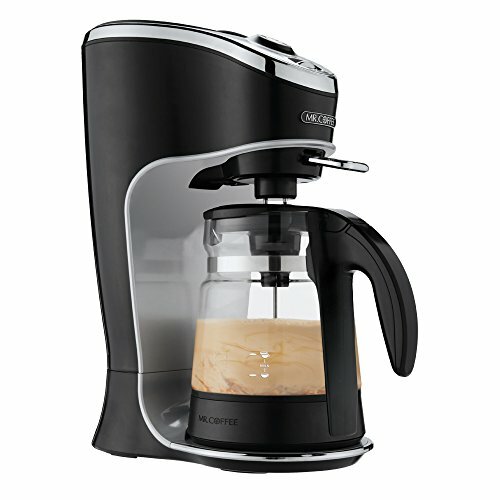 The fully automated process brews your coffee while heating and frothing milk to create a delicious latte. Bonus: you can also use the machine to make hot chocolate! The unit’s 24-ounce capacity means that you can make several drinks at once, ideal for entertaining or for busy households where several people drink coffee. The machine has a neat power-down feature that shuts the unit off once your drink is ready. The machine is quick and easy to clean up, although only the coffee brew basket is dishwasher safe; you need to wash the carafe by hand. Although the Mr. Coffee Latte machine is one of the cheapest units on the list, it’s a good-quality, reliable product and is extremely simple to use. It’s ideal for an affordable, first-time latte brewing machine. If you’re already fairly proficient as a home barista and you’d like to learn how to brew coffee shop standard espresso, the De’Longhi EC702 semi-auto machine is perfect. The EC702 is a decently priced, reliable espresso machine that gives you every feature you’re likely to want and a few more too. The machine’s milk frother will give you perfectly steamed and frothed milk every time, so you can be sure that the finished brew will not only be better than the one you usually get at your coffee shop. It’ll be cheaper and a whole lot more convenient too. 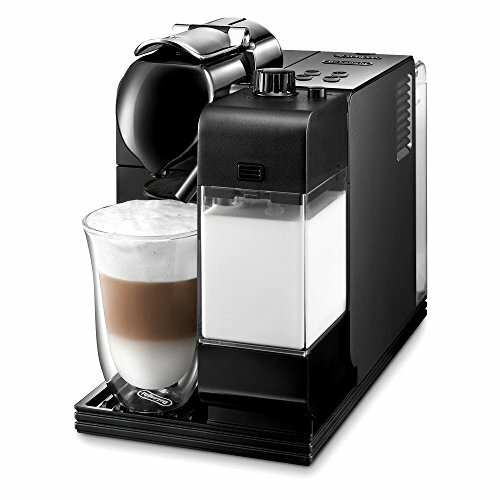 De’Longhi also make a specialized latte maker in the form of the Nespresso Lattissima. As you might guess from the name, the Lattissima is a capsule-based espresso brewer that has an integral automatic milk frother. We think that this machine gives you the best of both worlds; it’s reasonably priced, and you can enjoy a genuine latte at the push of one button. You can use the Lattissima to make macchiato, espresso, and cappuccino, as well as latte. The machines’ patented thermoblock heating system means that the Lattissima is ready to start brewing in just 40 seconds. Like all De’Longhi’s coffee making machines, the Lattissima is beautifully designed and will grace the aesthetic of any countertop. When it comes to coffee, Keurig needs no introduction. 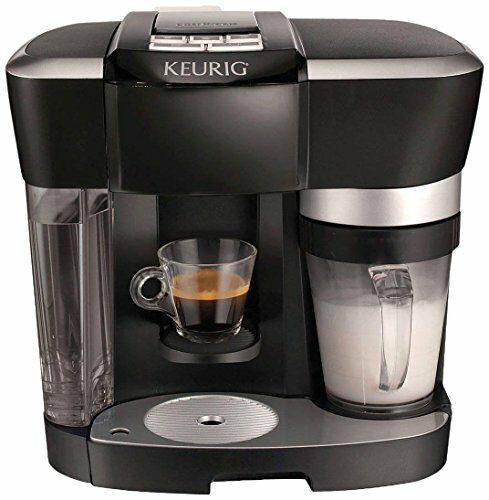 Keurig makes a vast array of different coffee making machines and associated consumables from carafes and filters to flavored coffee pods. While we typically don’t recommend machines that take away from a barista’s brewing autonomy, if you’re looking for something in the super-auto realm, Keurig’s got you covered. The latte making machine is, like all Keurig machines, very easy to use. The neatly designed array of buttons on top of the unit allows you to choose between different brew strengths and three different frothing modes: latte, cappuccino, and cold froth. One useful feature on this machine that we like is the auto-on/auto-off power saver mode. That means that you won’t be wasting money on energy if you forget to turn the unit off at night or when you go out to work for the day. The machine is quick too, taking just one minute to brew you a cup of coffee. The one thing about all Keurig’s coffee making machines that we don’t like is the fact that you can only use their Keurig-brand coffee pods. Now, this is not a problem if you enjoy Keurig coffee. However, it’s a slight bugbear if you wanted to try something new from a different coffee brand. Now, so far we’ve looked at latte machines that are simple to operate but may be somewhat limited in scope. Our next offering takes home coffee brewing to the next level. And then some. Breville’s dual boiler machine will take you into the higher-end price bracket, but you certainly get a lot for your money. This latte making machine has a commercial design with a dual boiler system. One boiler steams the milk for your beverage, while the other one is for pulling the espresso shots. The dual boiler configuration allows you to control the temperature of each so that you can experiment with flavors for different coffee blends. There’s a neat LCD that clearly indicates the temperature of each boiler for ease of monitoring. Other talking features include a fully customizable low-pressure pre-infusion, auto-startup, pressure gauges, and a shot clock. There’s also a descale alert and LCD-assisted descale procedure, which is essential if you live in a hard-water area. Don’t know if you do? Fear not. This model includes a water hardness test strip. So, although the Breville is not a simple, chuck in a pod and press a button machine (which isn’t always ideal in our opinion), it’s a very tempting purchase for anyone who takes home brewing seriously. If you decide to invest in one of these, you won’t ever need to buy another. It’s safe to say that freshly ground beans always give the truest flavors of the roast and produce a better brew. 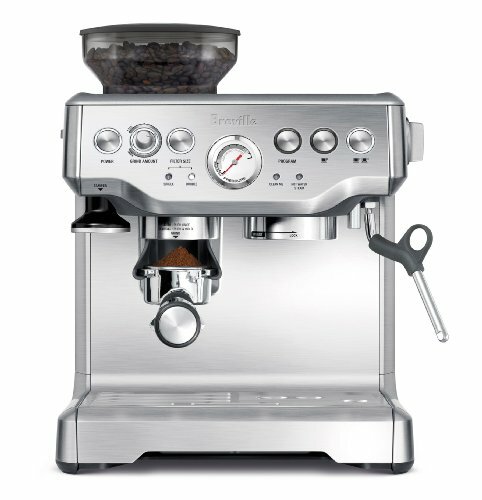 Breville’s BES870XL comes with a stainless steel burr grinder and a powerful 1,600-watt thermos coil heating system to give superior-quality ground. Also, the purge function allows you to adjust the water temperature. And even beginners will appreciate the pressurized dual-wall filters that make it easy to create customized coffee blends. The Italian-made 15-bar pump creates the perfect temperature for premium flavor espresso. But what about making lattes? Well, the machine has a 360-degree swivel action steam wand for perfect milk texturing. Combine that with the delicious espresso shot that the BES870XL gives you, and you’ll be in creamy latte heaven. The attractive yet practical brushed stainless steel design makes this well-designed and efficient piece of brewing kit a great addition to any kitchen countertop. 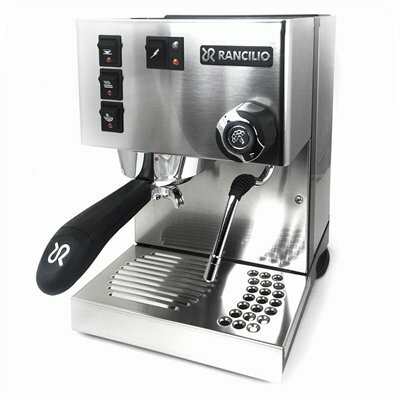 If you like to take your latte making equipment with you when you go visiting other coffee fans, you’ll want to have a Rancilio Silvia espresso making machine in your brewing armory. The machine is lightweight and designed to be easily portable, with a robust iron frame and stainless steel side panels to retain a sleek, traditional look. You’ll may notice the porta filter handle that features on Rancilio’s commerical machines. Well, this scaled-down espresso machine has one too. Features such as superior heat retention and auto-managed steam pressure deliver commercial quality functionality in a small, home-use machine. Thanks to a perfect grind and stable heat, you’ll enjoy a barista-quality espresso every time. A brass boiler has excellent steaming power, and a generous water reservoir allows you to make multiple brews without the need to refill. As to making lattes, the stainless steel wand is ideal for steaming and texturing milk. So, latte away! Now you know what’s out there, you need to think about the best way of choosing your ideal home latte making machine. First off, you need to decide just how much money you’re willing to shell out on the machine of your dreams. Prices vary from under $100 up into the thousands, depending on how complex and versatile you want your latte machine to be. There are a lot of machines out there, and you can scale down your search right away by setting a budget before you start looking. Ease of use is another biggie when choosing a home brewing latte machine. Of course, making a perfect latte is made to look ridiculously easy when done by an experienced barista in your local coffee house. But if you’re a beginner faced with an array of levers, knobs, and buttons, you’ll probably wish you’d chosen a more user-friendly machine! So, start with a simple machine that’s easy to use. Once you’ve gotten more experienced, you can choose to upgrade to something more advanced. Also keep in mind: if you like things like control and customization, look for machines that are semi-automatic or that have a lot of options for altering the temperature, brew time, etc. While they may seem inconsequential at first, these factors are also important to consider. After all, the whole idea of buying a home latte making machine is to save you time and make your life a little less hassled. Ideally, you want a machine that’s virtually maintenance-free, and that can be cleaned quickly, without having to take the whole thing to pieces first. Water reservoir size is very important if you are planning on using the machine to make multiple brews. The larger the water tank on your machine, the less often you’ll need to refill it, which will matter to you if you like to entertain. Removable reservoirs are also a big plus; it’s so much easier to remove the reservoir to fill or clean it at your sink that it is to cart the whole latte machine across the kitchen. If countertop space is at a premium in your kitchen, don’t buy a huge machine that hogs the whole surface area! You’d be amazed just how many coffee enthusiasts buy the biggest, fanciest latte machine they can find, only to consign it to the pantry after just a few uses because it’s in the way. (Not the dating app) The key to a perfect ground and ultimately perfect coffee is a good grinder. Many decent-quality home espresso machines have an integral grinder. Ideally, you want a noiseless ceramic grinder, but it’s more usual to find a stainless steel one. If you can’t afford a machine with its own grinder, you’ll need to buy your own. And with you in mind, we’ve put together this helpful guide to help you make the right choice. 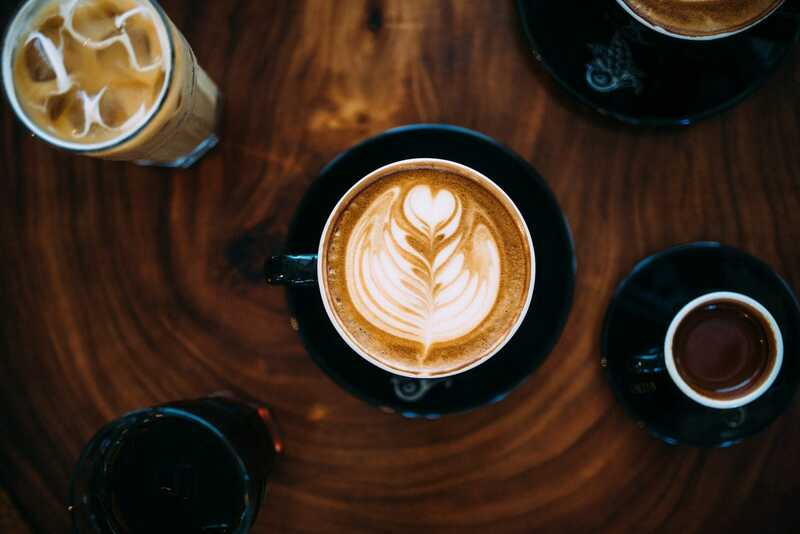 Although making your latte from scratch with an espresso machine and the basic raw ingredients is undoubtedly every aspiring home barista’s ultimate goal, sometimes it’s acceptable to take the easy route by buying a home latte making machine or a super-automatic espresso machine option. Gaggia vs Jura: What Brand Has the Better Automatic Machine? Are you a coffe lover that lives to be served? If so, you should probably be looking at automatic espresso machines. In this article we compare to of the top brands, Gaggia vs Jura, so that you can make the best decision for your espresso needs. 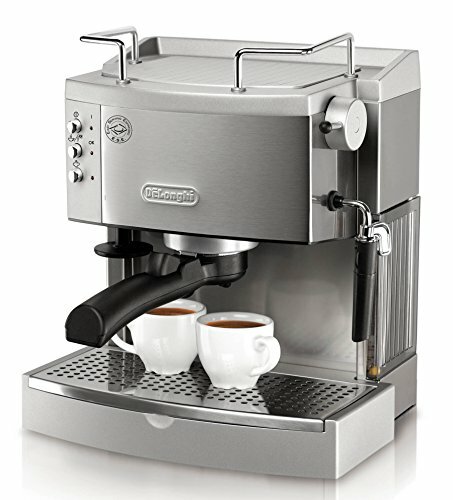 Overwhelmed by all of the espresso machine options offered by this star-quality Australian company? 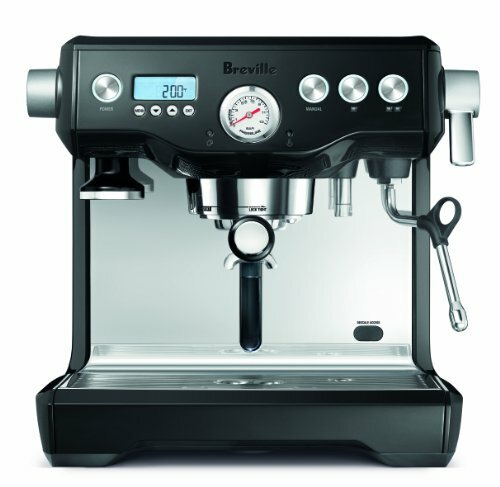 Don't worry; we've got you covered with this comprehensive Breville espresso machine review. Does your new bio read "ISO a pick-me-up"? Because Roasty has the perfect candidates that might be your next espresso-style match made in heaven. Read on for 15 bold espresso drink recipes, and find your happily (caffeinated) ever after. Craving something with a strong espresso kick but not sure how to decide between the plethora of options? We've broken down two of the most popular drinks, cappuccino vs mocha, to help you figure out which one works best for your taste buds.